Top 10 streamed games of the week: Is Fortnite about to fall from the top? This chart covers the week commencing January 21st to January 27th. As always, Fortnite is top of the chart. However, the battle royale only hung on to first place by a thread this week, with League of Legends just 100k views behind it. Fortnite is usually millions of views clear of League, but a couple of changes meant that Blizzard's MOBA has managed to close the gap. 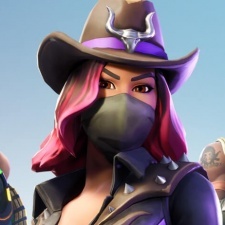 For one, Fortnite flagship creator Tyler 'Ninja' Blevins has been off Twitch all week, causing a significant drop in views. Additionally, the League of Legends' LCS championship kicked off this week, giving LoL a huge burst of views. There's a new entry in third place for last week; Capcom's Resident Evil 2 has racked up over 13.6 million views in its launch week. Dota 2 takes fourth with a 9.3 per cent increase in views. PUBG falls to fifth from third after an 8.1 per cent decrease in hours watched. 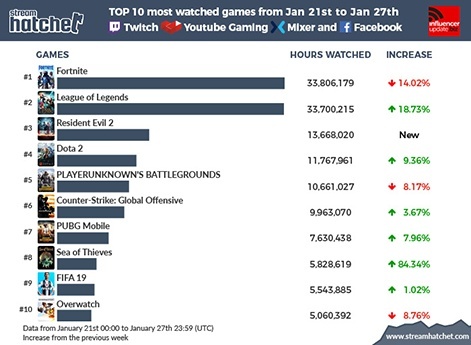 CS:GO takes sixth place after a small but significant 3.6 per cent increase in views. Seventh place is taken by PUBG Mobile, the portable equivalent of the battle royale. It amassed over 7.6 million hours watched this week, an increase of 7.9 per cent. Another new entry in eighth place is Sea of Thieves. Rare's pirate 'em up dropped almost a year ago but has seen a resurgence on Twitch in the last week, with some huge streamers picking it back up. It racked up over 5.8 million hours watched which equated to an 84.3 per cent increase in views. FIFA 19 is still holding on in ninth place, racking up over 5.5 million views in the last week. Overwatch takes the final spot after an 8.7 per cent decrease in views, knocking Call of Duty: Black Ops 4 off the board.